2. Cyber warfare is getting real. The recent WannaCry incident shut down 16 hospitals in the UK, which created chaos, as practitioners had to go back to paper. As we are now living in the IOT (Internet Of Things) era, we should be worried about ransomware and hacking. Infusion pumps, pacemakers and other devices can be accessed and their characteristics and operating parameters can be modified.It is interesting that HIPAA regulations already covered many of the security measures that could prevent and/or manage these incidents, but in the past, most institutions focused mostly on patient privacy. Of course, patient privacy is a major issue, but it might be prudent for institutions to shift some of the emphasis on network security instead of privacy as that could be potentially more damaging. Imagine the potential impact of one patient’s privacy being compromised vs the impact of infusion pumps going berserk, or a complete hospital shutdown. 3. Facilitating the management of images created by “ologies” is still very challenging. Enterprise imaging, typically done using an enterprise archive such as a VNA as imaging repository, is still in its infancy. The joint HIMSS/SIIM working group has done a great job outlining all of the needed components and defined somewhat of an architecture, but there are still several issues to be resolved. When talking with the VNA vendors, their top issue that seems to come up universally is that the workflow of non-traditional imaging is poorly defined and does not lend itself very well to being managed electronically. For example, imagine a practitioner making an ultrasound during anesthesia or an ER physician taking a picture of an injury with his or her smart phone. How do we match up these images with the patient record in such a way that they can be managed? Most radiology-based imaging is order driven, which means that a worklist entry is available from a DICOM Modality Worklist provider, however, most of the “ologies” are encounter driven. There is typically no order, so to go hunting for the patient demographics from a source of truth can be challenging.There are several options, one could query a patient registration system using HL7, using a patient RFID or wristband as a key, or, if FHIR takes off, one could use the FHIR resource as a source, or one could use admission transactions instead (ADT), or do a direct interface to a proprietary database. There is probably another handful of options, which is the problem as there is no single standard that people are following. The good news is that the IHE is working on the encounter-based workflow, so we are eagerly awaiting their results. Patient engagement is the activity of providers and patients working together to improve health. A patient’s greater engagement in healthcare contributes to improved health outcomes, and information technologies can support engagement. Patients want to be engaged in their healthcare decision-making process, and those who are engaged as decision-makers in their care tend to be healthier and have better outcomes. Many think of patient engagement as being equivalent to having a patient portal. The top reasons for patients wanting to use a portal are for making appointments, renewing prescriptions and paying their bills. However, none of these is a true clinical interaction. Face-to-face communication using, for example, Skype or another video communication, or just simply having an email exchange dealing with clinical questions are very important. One of the issues is that the population group that is the first to use these portals are also the group who already take responsibility for their own health. The challenge is to reach the non-communicative, passive group of patients and keep a check on their blood pressures, glucose levels, pacemaker records, etc. Also, portals are not always effective unless they can be accessed using a smart phone. This assumes of course that people have a phone, which was solved by one of the participants in the discussion by providing free phones for homeless so that texts can be sent for the medication reminders and checking up on them. Different approaches are also needed, as a point in fact, Australia had made massive investments in patient portals but because patients were by default set up as opt-out, only 5 percent of them were using portals. One of the vendors showed a slick implementation whereby the images of a radiology procedure were sent to the personal health record in the cloud and from there could easily be forwarded to any physician authorized by the patient. This is a major improvement and could impact the CD exchange nightmare we are currently experiencing. I personally take my laptop with my images loaded on it to my specialists as I have had several issues in the past with the specialists having no CD reader on their computers or lacking a decent DICOM viewer. 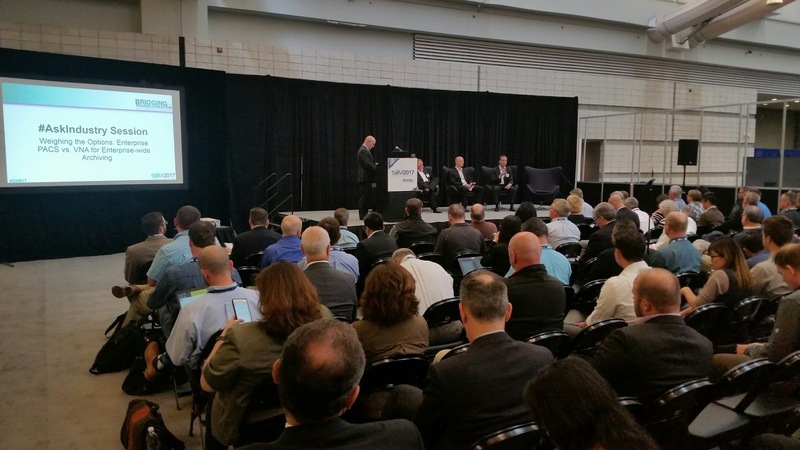 There are still major opportunities for vendors to make a difference here. example of hype, it would be the new FHIR standard. It has been touted as the one and only solution for every piece of clinical information and even made it into several of the federal ONC standard guidelines. Now back to reality. We are on its third release of the Draft Standard for Trial implementation (DSTU3), typically, there is only one draft before a standard, and it is still not completely done. Its number of options are concerning as well. And then, assuming you have an EMR that has just introduced a FHIR interface (maybe DSTU version 2 or 3) for one or more resources, are you going to upgrade it right away to make use of it? But to be honest, yes, it will very likely be used for some relatively limited applications, some examples are the physician resource used by the HIE here in Texas finding information about referrals, or, as one of the SIIM presenters showed, a FHIR interface to get reports from an EMR to a PACS viewing station. But there are still many questions to be addressed to use what David Clunie calls “universal access to mythical distributed FHIR resources”. 6. The boundary between documents and images remains blurry. When PACS were limited to radiology images, and document management systems were limited to scanned documents that were digitized, life was easy and there was a relatively clear division between images and documents. However, this boundary has become increasingly blurry. Users of PACS systems started to scan documents such as orders and patient release forms into the PACS, archiving them as encapsulated DICOM objects, either as a bitmap (aka as “Secondary Captures”) or encapsulated PDF’s.Some modalities such as ophthalmology were starting to create native PDF’s, bone densitometry (“DEXA”) scanners were also showing thumbnail pictures of the radiographs with a graph of its measurements in a PDF format. Then we got the requirement to store native png, tiff, jpeg’s and even mpeg videos in the PACS as well. At the same time, some of the document management systems were starting to store jpegs as well as ECG waveforms that were scanned in. By the way, there has been a major push for waveform vendors to create DICOM output for their ECG’s, which means they would now be managed by a cardiology PACS.And managing diagnostic reports is an issue by itself, some store them at the EMR, some at the RIS, some at the PACS and some at the document management system. The fact that the boundary is not well defined is not so much of an issue, what becomes clear is that each institution decides where the information resides and creates a universal document and image index and/or resource so that viewers can access the information in a seamless manner. 7. The DICOMWeb momentum is growing. DICOMWeb is the DICOM equivalent of FHIR and includes what most people know as WADO, i.e. Web Access to DICOM Objects, but there is more to that, as it also allows for images to be uploaded (STOW), or queried (QIDO) and even provides a universal worklist allowing images to be labelled with the correct patient demographics before sending them off to their destination.There are three versions of DICOMWeb, each one builds on the next one with regard to functionality and a more advanced technology making them current with state-of-the-art web services. One should realize that the core of DICOM, i.e. its pixel encoding and data formats is not changed, we still deal with “DICOM headers” but that the protocol, i.e. the mechanism to address a source and destination as well as the commands to exchange information has become much simpler.As a matter of fact, as the SIIM hackathon showed, it is relatively easy to write a simple application using the DICOM resources. As with FHIR, DICOMWeb is still somewhat immature, and IHE is still trying to catch up. Note that the XDS-I profile is based on the second DICOMWeb iteration, which is based on SOAP (XML encapsulated) messaging that has recently been retired by the DICOM standards committee. The profile dealing with the final version of WADO, called MHD-I is still very new. There is a pretty good adoption rate though; and many PACS systems are implementing WADO, which unlike FHIR can be done by a simple proxy implementation on an existing traditional DICOM interface. a. You need a curved area when looking at multiple monitors with a table and chair that can rotate making sure you always have a perpendicular view. Not only does this improve the view angle distortion from the monitors but also is easy on your neck muscles. b. Everything should be voice activated and by the way, all audio in and out should be integrated such as your voice activation, dictation software and phone. c. Two steps are too many and two seconds for retrieval is too much. It is amazing to think that retrievals of images in the 1990’s, using a dedicated fiber to the big PACS monitors of the first PACS systems used by the Army, were as fast or possibly faster than what is state-of-the-art today. Moore’s law of faster, better, quicker and more computing power apparently does not apply to PACS. d. Multiple keyboards is a no-no, even when controlling three different applications on 6 imaging monitors (one set for the PACS, one set for the 3-D software, and one set for outside studies). Hopefully, vendors are taking notes and will start implementing some of these recommendations, it is long overdue. 9. Adding a picture to the exam to assist in patient identification. As we know, there are still way too many errors made in the healthcare delivery that potentially could be prevented. Any tool that allows a practitioner to double-check patient identity in an easy manner is recommended. 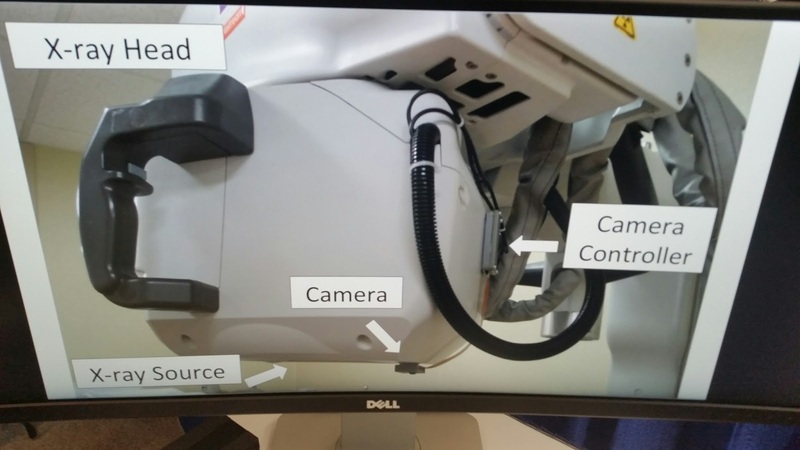 A company that was exhibiting at SIIM had a simple solution as it takes a picture of a patient and makes it part of the study by creating a DICOM Secondary Capture of the image. It consists of a small camera that can be mounted at the x-ray source. I noticed two potential issues that need to be addressed: does it work with a MRI, i.e. what is the impact of a strong magnetic field on its operation? Second, now we know how to identify the patient better, how would it be to de-identify the study if needed? We would need to delete that image from the study prior to sharing it for the purpose of clinical trials, teaching files, or when sharing it through any public communication channel. 10. Dashboards assist in department awareness. I am all in favor of dashboards, both clinical and operational as it typically allows one to graphically see what it going on. 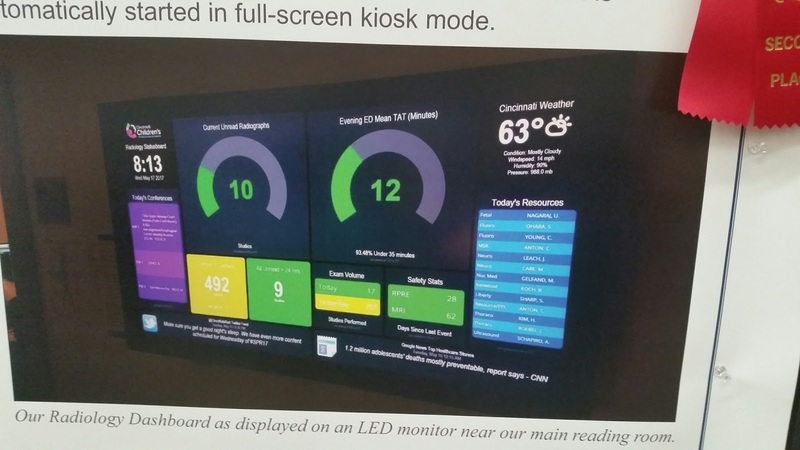 I liked the poster that was shown by Cincinnati Children’s showing the display that is placed in a prominent space in the department and shows its operational performance such as the number of unread procedures, turnaround time, a list of doctors who are on call, and also a news and weather link. They pulled this data from their PACS/RIS system doing some simple database queries. This is a good example of how to provide feedback to the staff. 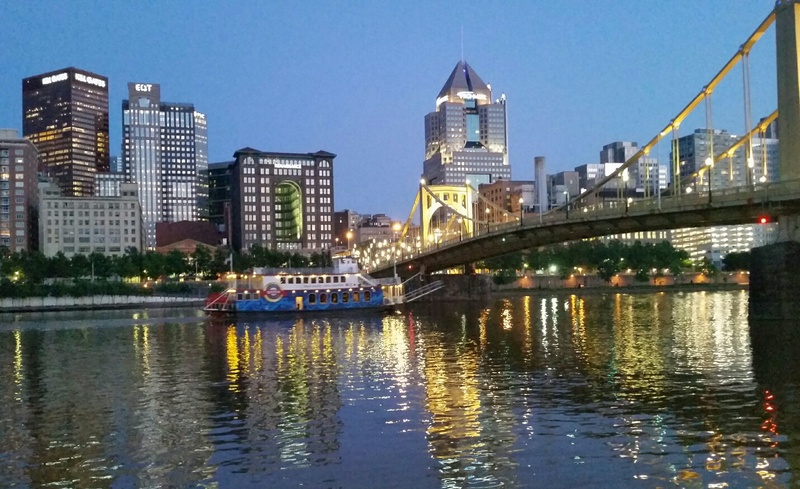 As mentioned earlier, I thought that SIIM2017 was a pretty good meeting, not only for networking with fellow professionals, but also learning what’s new, and seeing a couple of new innovative small start-up companies, especially in the AI domain, and last but not least, enjoying a bit of Pittsburgh, which pleasantly surprised me. Next year will be in DC again, actually National Harbor MD, which despite its close location to Washington will not be a match for this year’s, but regardless, I’ll be looking forward to it. Top 10 lessons learned when installing digital imaging in developing countries. probably an understatement. The unique environment, lack of resources, money and training, pose barriers to creating a sustainable system. As anyone who has worked in these countries will attest, sustainability is key, witnessed by the numerous empty buildings, sometimes half finished, non-working equipment due to lack of consumables, spare parts, or simply not having the correct power, A/C or infrastructure environment. I learned quite a bit when deploying these systems as a volunteer, especially through gracious grants by Rotary International and other non-profits, which allowed me to travel and support these systems in the field. Some of these lessons learned seem obvious, but I had to re-learn that, what is obvious in the developed world, is not necessarily the case at the emerging developing countries of the world. 1. You need a “super user” at the deployment site with a minimum set of technical skills. Let’s take, as an example, a typical digital system for a small hospital or large clinic, which has one or two ultrasounds, a digital dental system and a digital X-ray, either using Direct or Computerized Radiography (DR or CR). These modalities require a network to connect them to a server and a diagnostic monitor and physician viewer. Imagine that the images don’t show up at the view station, someone needs to be able to check the network connection, and be able to run some simple diagnostics making sure that the application software is running. In addition to being able to do basic troubleshooting on-site, that person needs to also function as the single point of contact for a vendor trying to support the system and be the ears and eyes for support. 2. Talking about “single point of contact,” I learned that it is essential to have a project manager on-site, which means that one person arranges for equipment to be there, knows what the configuration looks like, checks that the infrastructure is ready, does the follow up, etc. It is unusual that the local dealer does all of this. There also might be construction needed to make a room suitable for taking X-rays (shielding etc. ), A/C to be installed to prevent the computers from overheating, network cables to be pulled, etc. ; there has to be a main coordinator to do this. 3. You also need a clinical coordinator on site. This person takes responsibility for X-ray radiation safety (which is a big concern) and also doing the QA checks, looking for dose creep (over exposing patients), reject analysis (what is the repeat rate for exams and why are they repeated). 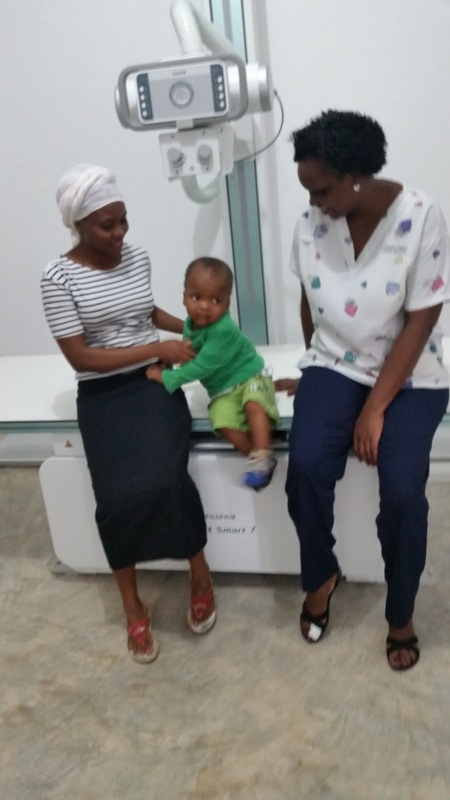 With regard to radiation safety, I have yet to see a radiation badge in a developing country, which is common practice for any healthcare practitioner who could be exposed to X-ray radiation in the developing world. As a matter of fact, I used to carry one with me all the time when on the vendor site and being in radiology departments on a regular basis. I would get calls from the radiation safety officer in my company when I forgot that I had left the badge in my luggage going through the airport security X-ray scanners. There is little radiation safety infrastructure available in developing countries, and the use of protective gloves, lead aprons and other protective devices is not always strictly enforced, this is definitely an area where improvements can be made. 4. Reporting back to the donors is critical. There are basically three kinds of reports which are preferably shared on a monthly basis, as a matter of fact, this is a requirement for most projects funded by Rotary International grants: 1) The operational reports that include information such as number of exams performed by modality (x-ray, dental, ultrasound), age, gender, presenting diagnosis, exam type, etc. 2) The clinical reporting which includes the quality measures such as exposure index, kV mAs, etc. and 3) Outcomes reporting which includes demographics, trends, diagnosis, etc. The operational reporting will indicate potential operational issues, for example, if the number of exams shows a sudden drop, there could be an equipment reliability issue. The clinical reporting will show if the clinic meets good practices. The outcomes reporting is not only the hardest to quantify but is the most important as it will prove to potential donors, investors and the local government the societal and population health impact of the technology. This information is critical to justify future grant awards. 5. Power backup and stabilizers are essential. Power outages are a way of life, every day there can be a 4 hour or more power outage, therefore, having backup batteries and/or generators in addition to having a local UPS for each computer for short term outages is a requirement. One thing we overlooked is the fact that if we have power from the grid, the variation can be quite large, for example, a nominal 220V can fluctuate between 100 and 500 Volts. Needless to say most electronic equipment would not withstand such high spikes, so we had to go back in and install a stabilizer at one site after we had a burnout, which is now part of the standard package for new installs. 6. Staging and standardization is a must. When I tried to install dental software on a PC on-site in Tanzania, it required me to enter a password. After getting back to a spot where I could email the supplier, I found that the magic word “Administrator” allowed me to start up the software, however, not until a loss of a day’s work as the time difference between the US and East Africa is 9 hours. After that, It took me only 5 minutes to discover the next obstacle, “device not recognized,” which did not allow the dental byte-wings to be used for capturing the X-rays. This caused another day delay as it took me another night to get an answer to solve that question. This shows that installing software onsite in the middle of nowhere is not very efficient unless you have at least 2 weeks time, which is often a luxury. And this was just a simple application, imagine a more complex medical imaging (PACS) system requiring quite a bit of configuration and setting up, it will take weeks. 1) Virtualize as much as you can, i.e. use a pre-built software VM (virtual machine) that can be “dropped in” on site. The other advantage of the virtual machine is that it is easy to restore to its original condition, or any other in-between conditions that are saved. It is interesting that the “virtualization trend,” which is common in the western IT world in order to save on computers, servers, and most importantly power and cooling capacity, is advantageous in these countries as well but more for ease of installation and maintenance reasons. 2) Stage as much as you can, but do it locally. If you preload the software on a computer in the US, ship it to let’s say Kenya, first you will be charged with an import duty that easily can be 40%, and you also might send the latest and greatest server hardware that nobody knows how to support locally. Therefore, the solution is to source your hardware locally providing local support and spare parts, and then stage it at a central local location that has internet access to monitor the software installation and then ship to the remote site. 3) Use standard “images” which goes back to the “cookie-cutter” approach, i.e. have a single standardized software solution, for maybe three different sizes of facilities, small, mid-size and large, so that the variation is minimal. 7. Use a dedicated network. This goes back to the early days of medical imaging in the western world. I remember when we would connect a CT to the hospital network to send the images to the PACS archive, it would kill the network because of its high bandwidth demands. It is quite a different story right now, the hospital IT departments have been catching up, and have been configuring routers into VLANS that have fiber and/or gigabit speed connections to facilitate the imaging modalities. But we are back to square one in the developing world; networks, if available, are unreliable, might be open to the internet and/or computers that are allowed to use flash drives (the number one virus source), and therefore connecting these new devices to that would be asking for trouble. Therefore, when planning a medical imaging system, plan to pull your own cables, and use dedicated routers and switches. If you use high quality programmable and managed devices, it could become the core of the future hospital network expanding beyond the imaging department. 8. Have an Internet connection. The bad news is that there is typically no reliable or affordable internet connection, however, the good news is that the phone system leapfrogged the cable infrastructure and therefore you should plan for a G3 compatible hot-spot that can be used to connect a support expert and take a look at the system in case there are any issues. 9. Training is critical. Imagine buying a car for your 16-year-old daughter and just giving her the keys and telling her that she’ll be on her own. No-one would do that, but now imagine deploying a relatively complicated system in the middle of nowhere, which will allow people to make life-and-death decisions, without any proper training. I am not talking about clinical training on how to take an X-ray or do an ultrasound, but the training on how to support these systems that are taking the images, communicating, archiving them and displaying them. You need a person who takes the weekly back-ups to make sure that if there is a disk crash they can recover the information, who will do the database queries to get the report statistics, do the troubleshooting in case an image has been lost or misidentified, is the main contact to the support people at the vendor, and so on. On- the-job-training will not be sufficient. The good news is that it is relatively easy to create training videos and upload them on YouTube (or better send them on a CD as internet access might not always be available). 10. Do not compromise on clinical requirements. I have seen darkroom processors being replaced with a CR and a commercial (i.e. non-medical) grade monitors to look at the images in a bright environment. This is very poor medical practice. No, you don’t need two medical grade 3 MegaPixel monitors at the cost of several thousands of dollars. Clinical trials have shown that a 2 Megapixel has the same clinical efficacy as a 3MP, but requires a user to use its zoom and pan tools a little bit more, which is acceptable in these countries. Therefore, the key is to use a medical grade monitor, which is calibrated to convert each individual grayscale value into a pixel that can be distinguished from each other. If this is not the case, there is no question that valuable clinical information will be lost. Also the so-called luminance ratio (difference between dark and white) does not have to be as high as long as the viewing environment is dark enough. So, as a rule of thumb, use an affordable medical grade monitor and put it into a dark room (paint windows, walls, hang curtains), don’t skimp on these monitors. In conclusion, none of these lessons learned are new, we learned most of these 20 years ago, but the problem is that most of them might be forgotten or assumed, at least that is what I did when venturing out to these developing countries. 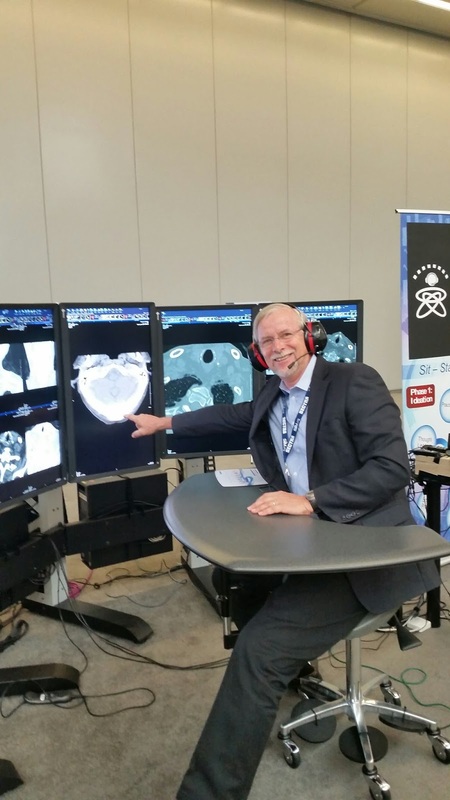 The good news is that we can apply most of what we have learned and therefore be successful in providing imaging to the remaining two-thirds of the world that does not yet have access to basic imaging capabilities and thereby still make a major difference.